BEIJING, Oct. 26, President Xi Jinping met with Japanese Prime Minister Shinzo Abe in Beijing Friday, calling on both sides to cherish the good momentum in bilateral ties. 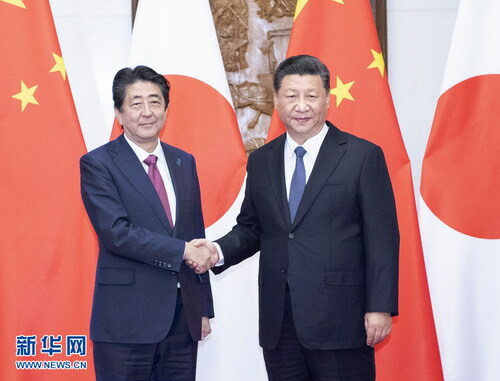 Xi welcomed Abe's official visit to China and spoke highly of his positive efforts in improving and developing China-Japan relations in recent years. "China and Japan, as close neighbors with great converging interests, are major world economies and influential countries," Xi said. "The healthy, steady and long-term development of China-Japan ties is in the fundamental interests of the two countries' people, and represents common expectations of the international community." "The treaty, signed by the elder generation of leaders of both countries, established a general direction of lasting peace, friendship between the two countries in the form of law, and provided solid support for both sides to conduct mutual beneficial cooperation, achieve common development, and properly deal with sensitive historical issues and the Taiwan issue," Xi said. "With concerted efforts by both sides, China-Japan ties are back on track and gaining positive momentum. This is worth cherishing." He called on both countries to "adhere to the various principles affirmed in the four political documents, stick to the general direction of peace and friendship, continue their joint efforts in mutual beneficial cooperation and further develop bilateral ties." "Under the new situations, China and Japan, increasingly interdependent in bilateral areas, also share more common interests and concerns on multilateral occasions," Xi said. "Thorough strategic communication should be carried out, and the two countries' dialogue mechanisms should play a better role via diverse channels at multiple-levels, so that each side can precisely grasp the other's development and strategic intentions." The two sides should effectively implement the consensus that they are partners rather than mutual threats, facilitate positive interactions, and deepen mutual political trust, Xi said. The Chinese president also called for tapping the potential of higher-level cooperation. "As China continues its reform and opens its door even wider to the world, more opportunities have emerged in China's cooperation with countries including Japan," Xi told Abe. "Japan is welcome to participate in China's progress in the new era." He expressed his hope of facilitating people-to-people exchanges between China and Japan, boosting mutual understanding, and encouraging the young to strive for friendship between both countries. "China and Japan should interact more actively in the security area, foster constructive security relations, and pursue the path of peace and development for regional peace and stability," Xi said. He called on the two sides to cooperate closely in the international arena, expand common interests, promote regional economic integration, jointly combat global challenges, safeguard multilateralism and uphold free trade and construct an open world economy. Xi reiterated the importance of keeping promises, noting that China and Japan should "act on the basis of their four political documents and consensus, deal with problems and differences constructively, so as to maintain the political foundation guiding healthy development of bilateral ties." Abe voiced his pleasure at paying an official visit to China at the "important moment" of the 40th anniversary of the signing of the treaty. "It is hoped that through this visit, the two sides will usher in a new era when 'competition is transformed into coordination,'" Abe said. As close neighbors, Japan and China should push forward bilateral ties on the basis of the principles set in their four political documents and in the spirit of "cooperating in a mutual-beneficial way and never posing a threat to each other," he said. The two countries should contribute to regional and international peace, as well as free trade, he suggested. Saying Japan welcomes and supports China's efforts in furthering opening-up, Abe expressed Japan's willingness to intensify exchanges with China to lay the social foundation to improve bilateral ties. The Japanese prime minister called on both sides to manage differences properly and make joint efforts to maintain regional stability and prosperity. Calling the Belt and Road Initiative "promising", Abe said Japan was willing to beef up cooperation with China in wide areas, including the exploration of third-party markets.